Islamabad: Two convicted terrorists were today hanged in Pakistan two days after the government ended a moratorium on capital punishment in terror-related cases. Dr Usman, a former serviceman guilty of involvement on the attack on Pakistan Army’s General Headquarters (GHQ) in Rawalpindi and on the Sri Lankan cricket team in 2009, was executed along with another ex-military personnel, Arshad. Four more executions will reportedly take place in Kot Lakhpat jail in Lahore where a high alert has been sounded. On Thursday, Pakistan’s military chief had signed death warrants for six terrorists on death row. Security officials said the six had been convicted by a military court and were awaiting execution. The announcement came hours after the government warned prison officials of a possible jailbreak in the restive northwest province of Khyber-Pakhtunkhwa following the end of the moratorium. Prime Minister Nawaz Sharif announced on Wednesday an end to the moratorium on the death penalty in terror-related cases after a Pakistani Taliban massacre at a military-run school killed 148 people, mostly children. 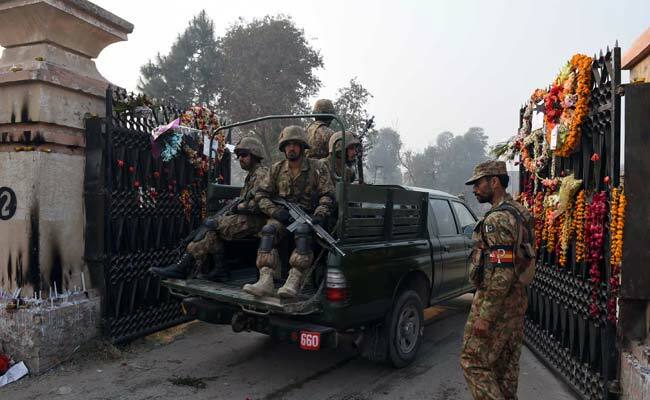 The assault in the northwestern city of Peshawar is the deadliest ever terror attack in Pakistan and has shocked the nation. Political and military leaders have vowed in response to wipe out the homegrown Islamist insurgency that has killed thousands of ordinary Pakistanis in recent years. THE HEAD BUTCHER IN THIS SLAUGHTER WAS A MAN CALLED UMAR MANSOOR.